From newborn to 17 months. Lisa Smith, a young mother of two little girls, was at her wits end, and very worried. She knew enough about child development to understand that things weren’t going well between her and her six-month-old daughter, Melissa. In stark contrast to her experience with first-born Laura, whose sunny disposition made parenting a joy, Melissa seemed to have come into the world with a chip on her shoulder. So easily frustrated was she that much of Lisa’s day was spent trying to figure out how to quiet her crying. It wasn’t colic, according to the pediatrician – just a fussy temperament that Lisa would have to learn to live with, and love. And that’s what had Lisa worried. Instead of feeling unconditional love for Melissa, she was feeling more and more frustration and resentment – emotions that she feared Melissa was feeling, too. The importance of loving your children is not earth-shattering news. What may be news to many parents, however, is the certainty with which researchers point to the first two years of life as especially critical – as the time when a child’s basic outlook on the world is forming. What’s more, research has also shown that, without a doubt, the factor most predictive of a positive outlook is a healthy and happy caregiver-infant bond. That’s where the word “attachment” comes in. This is the term used by child psychologists to label the emotional bond that forms between children and the significant adults in their lives starting soon after birth. We’re indebted to a British clinical psychologist, Dr. John Bowlby, for discovering the critical nature of this early bond. 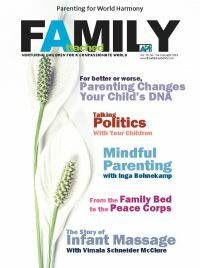 Based in part on the emotional damage he had seen among refugee orphans from World War II, as well as on children in his own clinical practice, Bowlby became convinced that the first two years of a child’s emotional life were not only relevant, but absolutely critical to future emotional well-being. What every parent hopes for is a secure attachment with their baby. But how does a parent go about making sure that happens? Thanks to Bowlby’s colleague, Dr. Mary Ainsworth, we now know that two of the most important ingredients are “sensitivity” and “responsiveness” on the part of the parent. In other words, the ability to read the baby well (know what he or she needs) and the willingness to meet those needs in a timely fashion. The bottom line of the attachment relationship: Children fall in love with those who meet their physical needs for food and warmth, comfort them when they are hurt, protect them when they are frightened, and, in general, make them feel respected, understood, and loved. Few of these wonderful words described Lisa and Melissa’s relationship. With both mother and baby experiencing daily doses of frustration and resentment, the danger of an insecure attachment was looming large. But that’s not what happened! Instead, the relationship began a dramatic turnaround in a matter of months, a change that Lisa credits to the introduction of signing into their interactions with Melissa. Specifically, Lisa began modeling signs that she thought her daughter might be able to use to communicate her needs more effectively – that is, without having to resort to crying. And it worked! The success Lisa had comes as no surprise, given our decades of research on the benefits of signing with hearing babies – research conducted at the University of California with the help of funds from the National Institutes of Health in Washington, D.C. In addition to data proving that signing accelerates, rather than hinders, verbal development and promotes intellectual progress, we had also uncovered convincing evidence that signing contributes significantly to the formation of a positive relationship between parent and child in the first years of life. As adults, we tend to forget what a complicated job babies face when they want to learn to talk. Unfortunately, until babies can conquer all the intricate movements necessary for speech, they are literally at a loss for words to tell us what’s on their minds. Learning to use simple signs bypasses all these obstacles, enabling babies to communicate effectively months earlier than would be possible were they to wait for words. Because signs make the task of “reading” the baby so much easier, they help parents meet their baby’s needs efficiently, reducing everyone’s frustration and decreasing tears and tantrums. Parents who are watching for signs are paying closer attention to whatever their baby does, thus increasing the chance that even non-sign signals will be detected and responded to appropriately. Signs help parents learn that their baby is fully capable of feeling loved and secure or anxious and rejected. That knowledge leads to the understanding that it really matters what a parent does. Signs enable babies to share their worlds with their parents, thereby increasing the joy that each takes in the other’s company. People who first hear about signing with babies think that it must be difficult to do, that it’s too much to add to a frazzled parent’s busy day. Nothing could be further from the truth. All that’s necessary is to do the same thing parents do to teach their babies to wave “bye-bye”: Simply say the word while modeling the motion as the baby watches. Repeat the pairing of the word and the sign frequently and, after babies have witnessed enough of these episodes, they begin to use the sign themselves. So, how did signs help Lisa and Melissa? According to Lisa: “As soon as Melissa began to sign, like magic, everything began to change. My husband, Wayne, noticed it, too. Finally, Melissa could let me know what she needed or wanted without crying all the time. She seemed as relieved as we were! © 2008 BABY SIGNS, INC. 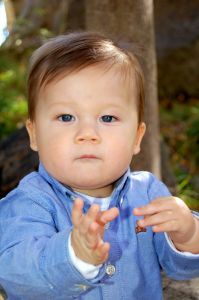 Drawing extensively from American Sign Language (ASL), the Baby Signs® Program teaches parents how to help their babies communicate using simple movements like fingers to lips for EAT, finger tips tapped together for MORE, and fist opening and closing for MILK. With signs like these and many more, babies can let parents know that they are hungry, thirsty, need more of something, or even that they feel feverish (HOT) or are experiencing pain (HURT). In addition to helping babies get their needs met, signing also enables babies to share the joys of their worlds with their parents. Babies are fascinated by what they see and hear as they move through their days and want their parents to share in their discoveries. Having simple signs to point out the BUTTERFLY in the garden, the CAT hiding in the bushes, or the DOG they hear barking outside provides babies a way to do just that. For more information, visit www.babysigns.com.